The King-Spadina area in downtown Toronto where I work is intensifying at such an incredible rate that one’s head is left spinning. There are three huge towers going up on the corner near my office building and that’s only the tip of the skyscraperberg. But then there’s this little itty bitty spot on King Street that hasn’t been developed—yet. 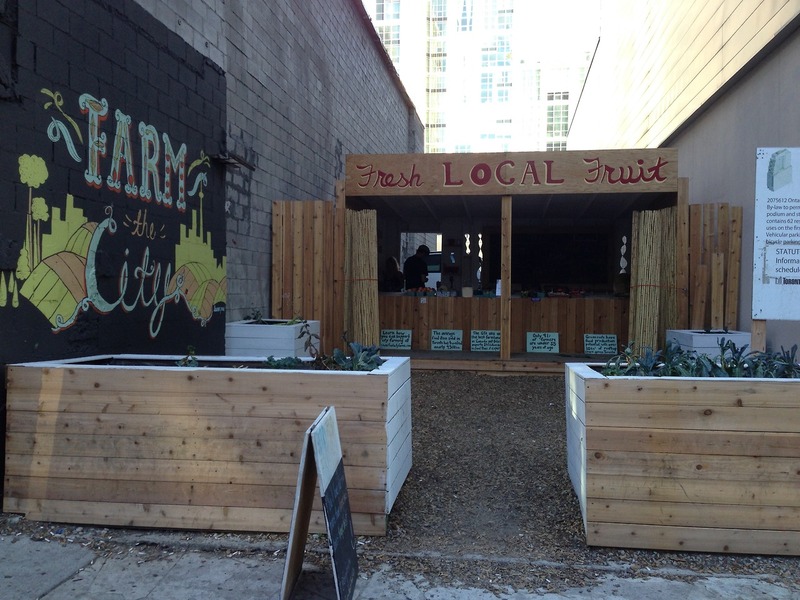 Instead of letting the lot just sit there, the developer, TAS, has partnered with local food organizations to turn the spot into a fresh fruit and vegetable market. [Full disclosure, I worked at TAS in the summer of 2013]. So instead of an empty lot with an ugly fence up around it, passersby are treated to planter boxes, benches made from boards, a nice mural, and—the best part—local vegetables and fresh fruit. Stepping off the crowded sidewalks onto the wood chip covered ground is like stepping out of the city and into one of those cute roadside fruit stands along rural highways. When we talk about the need to expand public spaces in our dense downtowns, we need to think about how we can temporarily activate those vacant lots waiting to be developed or those awkwardly shaped parcels that don’t serve a purpose right now. This is such a great, creative example of not only activating and beautifying an otherwise ugly blank spot, but giving local farmers a boost. Plus the strawberries are damn delicious. Working with developers to incentivize this kind of activity while their development application is pending, or while they’re considering what to do with the land, would be a great thing.